by fax to your state DDS or to Social Security. The records you send are automatically associated with the applicant’s unique disability claim folder. What are the benefits of sending records electronically? Who can send electronic records? Third parties, such as attorneys and claimant representatives. What Electronic Records Express options are available? The Electronic Records Express options are online via Social Security's secure website or by fax. Social Security's Secure Website - Individual Patient or Student Records: Allows you to transfer records online using your Internet connection. Social Security's Secure Website - Multiple Patient or Student Records: Allows you to send batches of records online in a single operation using a scanner and your Internet connection. Fax: Allows you to use your fax to send records anytime day or night. 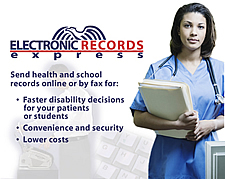 Are there any out-of-pocket costs for the Electronic Records Express options? All Electronic Records Express options are free of charge. In fact, you may save time and money by transmitting your records electronically. Are there any other options for sending records electronically? In addition to the Electronic Records Express options, high volume operations can use Secure Bulk File Transfer. This option requires commercial software and is not free of charge. It allows you to transfer records in an automated machine-to-machine mode, with workflow management, monitoring and reporting features. How secure is Social Security's Electronic Records Express website? The website has restricted access. Only authorized users can access the secure website by using their assigned user ID and password. Also, data transmission is protected by employing 128-bit or higher secure socket layer (SSL) encryption, which is the industry encryption standard for providing network security. Just call the Social Security Electronic Records Express Help Desk at 1-866-691-3061 or send them an email at electronic-records-express@ssa.gov for additional information.